I have given up sugar for Lent! 'Crazy' I hear you say! Perhaps. I read so many things these days about how bad sugar is for us and, whilst generally I don't strictly follow any diet restrictions, I do try to limit my refined sugar intake and, in particular, try to limit the amount of sugar that Little Whisk consumes. So I have decided for Lent to completely cut refined sugar out of my diet and try where possible to avoid added natural sweeteners such as honey and maple syrup. I don't think this is something that I could follow long term but I am interested to see the impact that it has on my energy levels (and weight). So far the most difficult thing has been the realisation that all my favourite chili sauces (I LOVE a chili condiment) contain a ton of sugar. However, in cutting out sugar I don't want to resign myself to a purely savoury diet over the next six weeks so I am going to be trying out a number of sugar-free bakes and snacks. I'm hoping that I can find some good alternatives to the sugary, naughty cakes that I love so much. Some alternatives for mid-week anyway! As I mentioned in my previous post I am going to be revamping the blog in the coming weeks, and I am planning to move more in the direction of healthy recipes, with a focus on quick weeknight meals and sugar-free snacks. I would love to know if there is anything in particular that you would like me to feature, or particular diets that you would like me to cater for. First make the apple puree (if you do not already have some prepared). Peel, core and finely dice the apple and place in a small saucepan with the water. Simmer for 10 - 15 minutes until the apple is very soft and has broken down to form a puree. Sift the flour, baking powder, and cinnamon into a mixing bowl. Make a well in the centre and add the apple puree, melted butter, milk, and eggs. Using a whisk mix well until combined. Heat a little butter or oil in a non-stick frying pan and spoon enough batter into the pan for each pancake. I used a 1/4 cup measure and managed to make 8 pancakes. Before the batter starts to set sprinkle 4 or 5 pieces of the diced apple into each pancake. Fry for a few minutes until golden brown and bubbles start to form. Flip the pancake and cook until golden on the other side. For the apple slices peel, core, and slice the apple into wedges. Toss in the cinnamon and fry in a little butter or coconut oil for 5 minutes until just starting to soften. 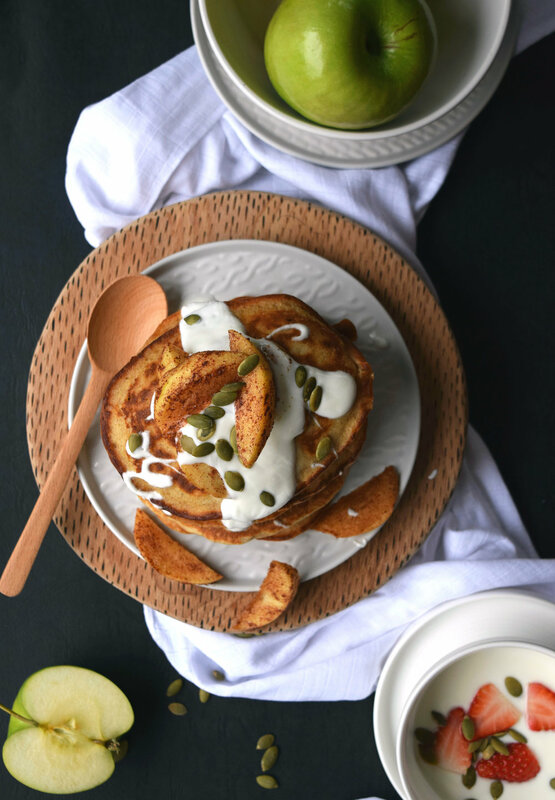 Serve the pancakes topped with the cinnamon apple slices. Also good with some yoghurt and seeds, or a knob of butter melted on the top. * If wanting to avoid butter then I would suggest substituting with a tablespoon or melted coconut oil.